Phuket has many Buddhist Temples and if you want to see more than just a beach, get a taste of local life, a temple is a good place to start. The largest is Wat Chalong, which can be quite busy with locals and tourists, but every area has it’s own small temple if you want more of a local flavour and a bit of history. 1. You should dress neatly when visiting any temple in Thailand. Men and women should not wear shorts or sleeveless shirts. Women in particular should avoid wearing revealing attire around monks. 2. Monks are forbidden to have physical contact, or to receive an object directly from a woman. To hand something to a monk a woman should place the object within reach of the monk, or give it to a man who can then hand it to the monk. 3. When entering any building within a monastery shoes must be removed. And when sitting in a temple, never point your feet towards any images of the Buddha. 4. You should bear in mind that despite the number of tourists that may be walking around taking pictures, a temple is a place of worship and a quiet sanctuary for the monks and devotees. You should be sensitive to cultural and religious considerations. Temples do not charge an entrance fee, but they do have donation boxes for you to make some merit. Money will go towards upkeep of the temple and the temple’s charitable activities. 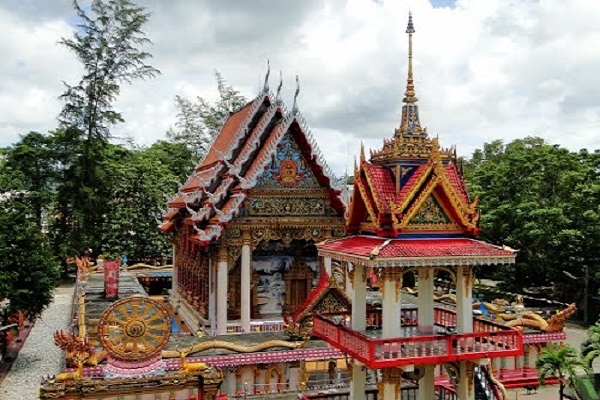 This is Phuket’s most important Buddhist temple. The temple is revered among Thais for its healing powers. The prayer hall contains the statues of three of the temples most venerated monks: Luang Por Chaem, Luang Por Chuang and Luang Por Gluam. However, it is Luang Por Chaem who is best known and who has given Wat Chalong its fame as a place of healing. In 1876, during the reign of King Rama V, there was a rebellion by the Chinese tin miners, or “Angyee”. Luang Por Chaem (Lord Abbott Chaem), the abbott of the monastery at the time, helped to stop the rebellion and acted as a mediator in the peace. The abbott was also a herbal doctor and setter of bones, and his skills were called upon to heal those wounded during the fighting. When visiting the temple people usually go to pay respect to the statues of the venerable monks, make offerings and ask for their blessing. 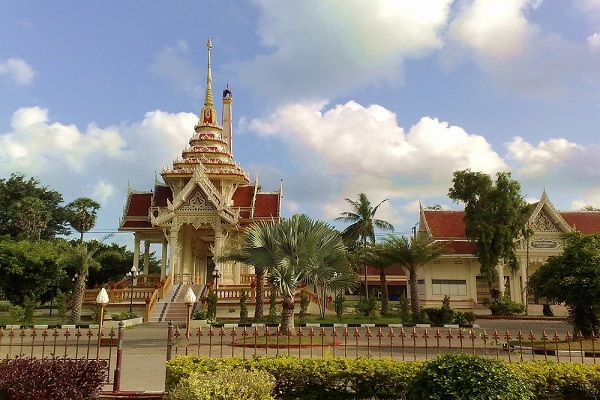 To get to Wat Chalong from Phuket City, take the Bypass Road heading south towards Chalong for about 8kms. 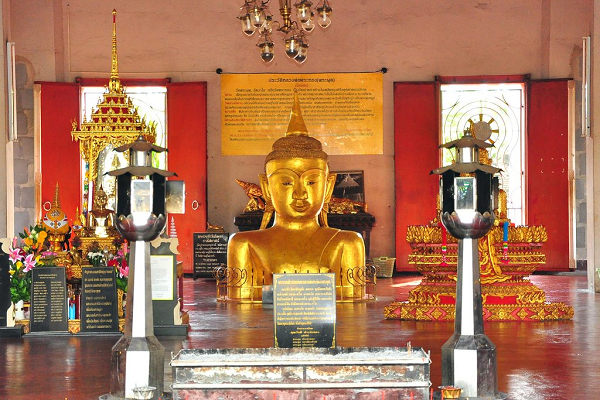 This is the oldest Buddhist temple on Phuket and was built when Thalang was still the capital of the island. The grounds of this historic temple are where the Battle of Thalang took place in 1785, when the local people fought off Burmese invaders. It is rumoured that the Burmese were after the temple’s Lai Tong, religious manuscripts which are folded like an accordion. These manuscripts were believed to contain treasure maps which the Burmese wanted to find. The temple is sometimes referred to as the “Temple of the White Blood” because of a woman who according to folklore, bled white blood when she was cut. The ordination hall is dedicated to her. The legend surrounding the statues says that anyone who tries to dig up the statue will suffer terrible misfortune or death. Therefore, a cast of cement and plaster was placed over the statue to prevent further attempts to remove it and a bot (temple hall) was built to house the statue. The statue remains half buried in the middle of the hall and is subject of great reverence by local people. Wat Khao Rang (or Sumnak Song Khao Rang) enjoys a great location in Phuket Town, on the slope of the popular Rang Hill. It has a large golden sitting Buddha – the first of its kind on the island and the spiritual centre of the island for many locals. 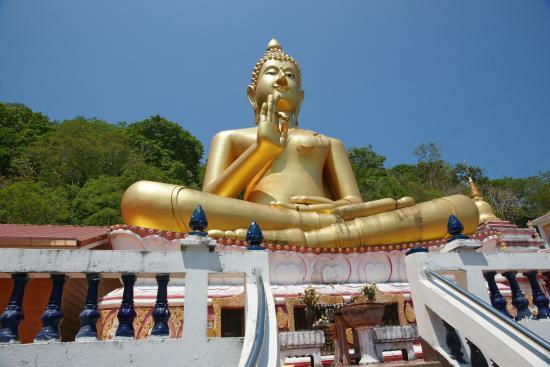 It was the first big Buddha image Phuket ever had until the giant Buddha was built in the Nakkerd Hills between Chalong and Kata.